Dubai, UAE, 16 January 2019: BurJuman is celebrating one of the UAE’s most-established retail events – the much feted Dubai Shopping Festival (DSF) – until the 2nd of February 2019. Shoppers and families are invited to visit the mall for a shopping bonanza filled with fabulous discounts and deals ranging from 25% to 75% off selected items. This year BurJuman honours the cultural diversity and spirit of tolerance found in the UAE by choosing an ‘Around the World’ theme for its DSF celebrations. A colourful array of installations and activities are on offer around the Mall, featuring photo opportunities and original experiential activities from countries such as the UAE, India, Philippines, Egypt and Italy. During the month-long shopping festival, for every AED 200 spent at BurJuman, customers will get the chance to enter a raffle draw to win cash prizes of up to AED 200,000! Customers spending a minimum of AED 200 in any BurJuman store will also be able to exchange their receipts for a unique branded BurJuman shopping bag. Be sure to hurry and grab one while stocks last! Commenting on this year’s DSF, BurJuman Management said: “The Dubai Shopping Festival is one of the highlights of the Dubai calendar, and we are once again excited to be participating in this carnival of fun, shopping and entertainment. We have always strived to be more than just a mall, and since opening over 27 years ago, we have become a place where families not only come to shop, dine and be entertained, but also a community venue where memories are created. 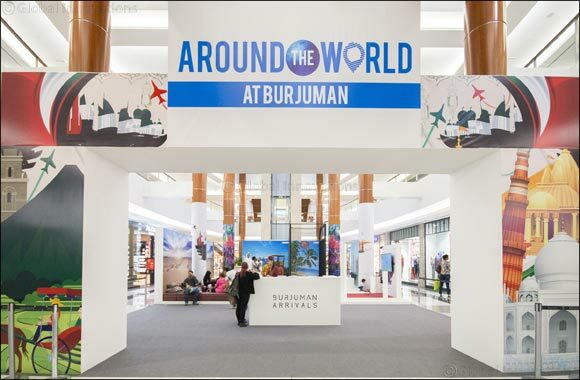 ‘Around the World at BurJuman’ runs until the 6th of February; daily from 2 pm to 10 pm.